FIRING: Michael Lane with a snapper. 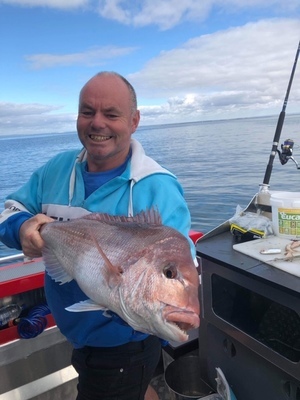 Snapper season reached full swing over the past week, with anglers finding fish right along the Bellarine Peninsula. Clifton Springs continued to be a reliable option for snapper, especially along the Point Richards channel. Michael Lane ventured off Clifton Springs to cross paths with a very well-conditioned snapper of 3.8kg and 70cm, which devoured his squid as bait. Other anglers boated snapper by using fish finders to mark schools of fish then sit back and cast baits. Soft plastics anglers found the spoil grounds a productive location, with the last few hours of the day prime time. Fish to 6kg made for great sport on light tackle. Squid continued dominating reports from Indented Head. Anglers drifting over reef and weed beds in 4m had plenty of success. St Leoanards produced nice numbers of pinkie snapper out from the pier. The last few hours of the day were prime-time. Whiting began gathering in the Bourke St area. Fresh pippies and fishing with some reasonable tidal flow was key to boating numbers of fish. The slack tide fished well for healthy numbers of squid between the boat ramp and Swan Bay’s entrance. Swan Bay was loaded on the run-in tide with pinkies, silver trevally, flathead and garfish. Most of the species were taken in mixed bags, with the fish a fair size too. Land-based anglers found Queenscliff Harbour a stand out. Plenty of silver trevally were taken on 2.5” grub-style soft plastics, while the odd snapper to 4kg was landed on half pilchards as bait. The Rip hosted schools of large Australian salmon but kingfish were still absent, although must not be far away. Anglers who found conditions conducive to fishing offshore encountered gummy sharks to 15kg and snapper to 6kg. Further west, all the estuaries were on fire. The Hopkins River gave up some thumping 1kg-plus bream on both bait and lure. On the freshwater scene, Lake Purrumbete’s new fishing platform saw anglers tangle with brown trout. Trolling along the east bank with Tassie Devils also produced fish. Lake Bullen Merri fished well for Chinook salmon. Pilchard fillets on very light running sinker rigs worked best, taking fish over 2kg. The Barwon River around Queen’s Park began producing a few redfin taken on small, deep-diving hard body lures. Next week anglers should make the most of snapper season off Clifton Springs while remembering to stay clear of ships if fishing near the channel. Queenscliff Harbour should be a worthwhile option for land-based anglers working the incoming tide with soft plastics, while freshwater enthusiasts could try Lake Bullen Merri for Chinook salmon.